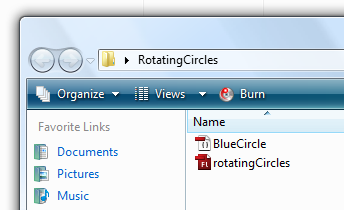 In the previous page, you created your circle movie clip with a class name of BlueCircle. Currently, the circle you created kind of just sits there. Let's fix that by adding some code that makes our circle move. We are going to be adding our code to the BlueCircle class itself. But, where is our BlueCircle class? Good question. It doesn't exist in a form that we can see or access. By default, the BlueCircle class is created in the background with its contents being magically thrown into the SWF file during publish/export. 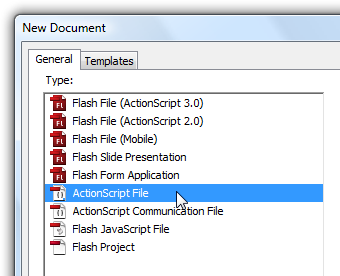 Once you have clicked OK, the New Document window will disappear, and your Flash drawing area will now be replaced by what is essentially a large code editor. 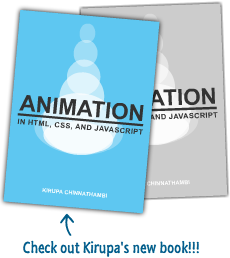 With the above code copied and pasted into your BlueCircle.as file, save this file by going to File | Save or by pressing Ctrl + S.
You'll be back to seeing what you saw in the previous page - a blank stage with a blue circle displayed. Don't worry though! Press Ctrl + Enter to see what happens. Notice that you now see your circle moving...circularly! In the next page, let's take a detailed look at what each line of code you just copied and pasted does.